One of the best things about mind-mapping, in general, is that it is by nature free-form. A mind map can be highly organized or very messy. It can be spartan, with just a few key words or phrases scattered around on a piece of paper or computer screen. Or it can be complex, and include things like Web links, images, categories, “to do” due dates, and so on. On the Web, MindMeister does a terrific job of facilitating both simplicity and complexity. It offers many features and terrific flexibility, but you can get started, with almost no learning curve, and empty your mind without worrying about how it works. 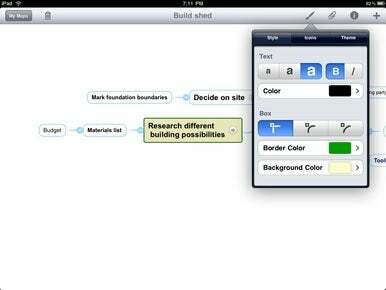 Similarly, MindMeister for iPad is a very good tool for mind-mapping, and enables you to create an unlimited number of maps. The $8 app from MeisterLabs lacks some of the power of its Web counterpart, but you can create a free online account that offers some features not available on the iPad, and sync maps between the iPad and your online account. The free account enables you to sync up to three maps to MindMeister online. You can sync as many as you want—and get some nifty features not available in the free online or iPad versions, as well—if you’re willing to fork out $60 a year. Mind(Meister) Over Matter: Layout options in MindMeister for iPad enable you to select from three kings of box types, three font sizes and many font colors, as well as regular, bold, or italic type styles, and many different box border and background colors. For most users, though, MindMeister for the iPad coupled with a free online account, should prove sufficient. In a recent upgrade (from 3.02 to 3.5), MeisterLabs added some powerful features. You can now embed Web links, e-mail addresses, and free-form notes in nodes. MindMeister 3.5 also added the ability to show and hide branches. Other very nice additions include more box (or node) styles and the provision of 10 themes. Available in MindMeister’s premium online version, but not on the iPad, is the ability to link attachments to nodes. Perhaps this will be in a future upgrade, as it’s technically feasible on the current iPad OS. When you sync maps to your online account, all are uploaded, even if you have more than three and a free account; however, only three are available online unless you upgrade your online account. You can export your maps, via Mail, in PDF, PNG, RTF, Freemind, and MindManager formats. However, the RTF files I exported couldn’t be opened by Word, Pages, or TextEdit on the Mac, or by Google Docs. While the premium, online version of MindMeister is clearly more powerful than the iPad version, it’s also significantly more expensive. Whether or not you take that price difference into consideration, MeisterLabs has delivered a user-friendly mind-mapping app that combines portability with enough power for most mappers.